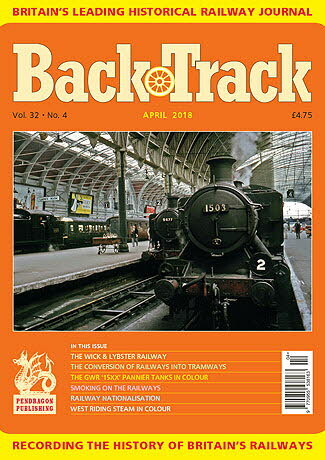 Railway Magazine | BackTrack April 2018 journal from Pendragon Publishing. The '15XX' Pannier Tanks - colour feature on the Great Western's last design of its characteristic 0-6-0 tanks. The Wick & Lybster Railway - Malcolm Timperley tells the story of a remote branch in the far north east of Scotland. Engine problems on the Lancashire, Derbyshire & East Coast Railway - by Bill Taylor. Smoking on the Railway - F. Nisbet reviews changing attitudes by passengers and railway companies from Victorian times on. Eric Bruton's 'Black Fives' - archive photographs taken by the distinguished photographer of the LMSR's consummate workhorse locomotives. A west Riding Portfolio -four colour pages of steam around Bradford, Huddersfield and Leeds in the mid-1960s photographed by David Rodgers. Railway Nationalisation - Edward Gibbins reveals some of the behind-the-scenes political wranglings leading up to the 1948 nationalisation. New Life for Old Lines - Geoffrey Skelsey surveys the conversion of railways into tramways. Southern gone West: Plymouth and its Branches - Part Four: Plymouth in Wartime - by David Thrower. Colliery lines at Swadlincote - some interesting industrial trackwork described by Bob Essery.